Flying to Neuchâtel (Neuenburg) in Switzerland usually requires a flight to Geneva (GVA), Zurich (ZRH), Bern (BRN) or Basel (BSL) airports followed by an easy train ride or car trip. The Swiss city Neuchâtel (Neuenburg) does not have its own airport but is within easy reach of Switzerland’s four main airports. Flying via Geneva (GVA) is usually the fastest while Bern is also within easy reach – train and bus connections take around 90 minutes. Direct trains connect Zurich Airport with Neuchatel in around two hours. Many cheap European flights arrive at Basel Airport (BSL), which is within two hours from Neuchatel by bus and train. Check-in at Neuchatel train station is possible for many flights departing from Geneva and Zurich (but usually not for airlines flying to the USA and UK), while Fly Rail Baggage allow passengers to transport luggage to either airport for final check in. Genève Aéroport (GVA) is usually the most convenient airport for travelers heading to Neuchâtel. Direct Swiss Railways (SBB / CFF) trains depart from the basement of Geneva Airport to Neuchatel with stops en route usually at Geneva main station, Morges, and Yverdon-les-Bains. Further connecting trains require a train change in Lausanne and are only sensible very late at night. The hourly direct Inter-City (IC5) train connects Geneva Airport and Neuchâtel in around 1h20. When traveling to the airport, only use IC5 trains with Genève-Aéroport as destination – IC5 trains with Lausanne as destination require a transfer. The earliest possible arrival at Geneva Airport by Inter-City (ICN) train from Neuchatel is around 7 am daily. The last direct IC5 train departs from the airport around 9 pm. 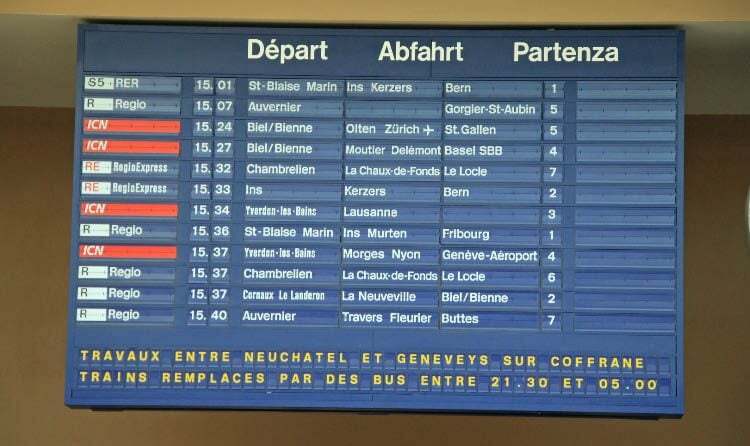 Later departures require a transfer in Lausanne and traveling times of around two hours. By car, Geneva Airport is around 120 km from Neuchatel with traveling time around 1h20. Taxi2Airport and Suntransfers quote around €500 for a pre-booked private transfer shuttle services from Geneva Airport to Neuchâtel. Traveling to Neuchatel via Zurich Airport (ZRH) is hardly more inconvenient than traveling via Geneva. Zurich Airport, Switzerland’s largest with most intercontinental arrivals, can be reached mostly twice per hour by train from Neuchatel in just less than two hours. The most convenient option is the hourly direct Inter-City (IC5 direction Lausanne) train between Neuchatel and Zurich Airport. Further options require a transfer – usually at Zürich Hauptbahnhof to the IC5 in the direction of either Lausanne or Geneva Airport – and are often a few minutes faster. The earliest possible arrival at Zurich Airport by train from Neuchâtel is just after 7 am and the last departure from Zurich Airport to Neuchatel leaves around 21:00 (direct) or around 22:40 (single transfer). By car, Zurich Airport is around 150 km from Neuchatel with traveling time just less than two hours. Taxi2Airport and Suntransfers quote around €660 for a pre-reserved private transfer shuttles from Zurich Airport to Neuchâtel. EuroAirport Basel-Mulhouse-Freiburg (BSL / MLH / EAP) is popular with cheap airlines and often provides the cheapest flights to Switzerland from many parts of Europe Transportation from Basel Airport involves a 15 minute bus trip to Basel Hauptbahnhof (main train station), which has excellent rail connections to the rest of Switzerland, Southern Germany, and Eastern France. The bus and train combination from Basel Airport to Neuchatel takes around two hours. From Basel station, train journeys to Neuchatel take around 90 minutes and always require a transfer. Either take the IC51 and change in Biel / Bienne to the IC5, or take any train to Olten and change here to the IC5. Early morning / late night, it is also possible to use slower S-Bahn train connections via Bern. The earliest possible arrival at Basel Airport from Neuchâtel (S-Bahn via Bern) is around 7:30 am. The last simple train transfer for Neuchatel usually leaves Basel around 10 pm. By car, Basel Airport is around 130 km from Neuchâtel with traveling time taking around 1h45. Taxi2Airport and Suntransfers give easy online quotations: around €500 for a pre-reserved private airport transfer shuttle service from Basel Airport to Neuchâtel. Bern-Belp (BRN) is the closest airport to Neuchâtel but the number of flights available to Bern is very limited. However, the airport is very convenient for especially drivers as it is only 60 km from Neuchatel with traveling time of just less than an hour. Taxi2Airport and Suntransfers give easy online quotations: around €300 for a pre-booked private transfer shuttle service from Bern Airport to Neuchâtel. On public transportation, Flughafen Bern-Belp can be reached usually twice per hour from Neuchatel. The easiest connection is by train from Neuchatel to Bern and then on bus 334 to the airport. The bus timetable is set according to flight departures and at times may wait for delayed flights. The second option is to change trains at Bern Hauptbahnhof and take S-Bahn S1 (direction Thun) and change at Rubigen to bus 160 towards the airport. This more complicated journey is sometimes faster and often the only available (especially during the middle of the day). The earliest possible arrival on public transportation at Bern-Belp Airport from Neuchatel is around 8 am and the last departure from the airport is around 11 pm. See Flying to Bern-Belp Airport (BRN) for more details on this small airport and transportation options. It is possible to check-in at Neuchâtel railway station for many flights departing from Geneva and Zurich Airports. Passengers can leave luggage and receive boarding passes usually up to 24 hours prior to flight departures. This service is usually not available for most low-cost airlines or flights heading to the USA, Canada, and the UK. For flights not available for station check in, passengers can send luggage with Fly Rail Baggage to the relevant airport station, collect the suitcases and check in normally at the airline desk at the airport. These services are around CHF22 per suitcase. The ease of direct trains from Neuchatel to Geneva and Zurich Airport makes these services a bit of a luxury for most. However, it can be handy for the infirm or travelers planning to make further sightseeing stops en route to the airport. See also Transportation to Neuchatel for general transport information to Neuchatel and Swiss Railways for timetables and tickets.